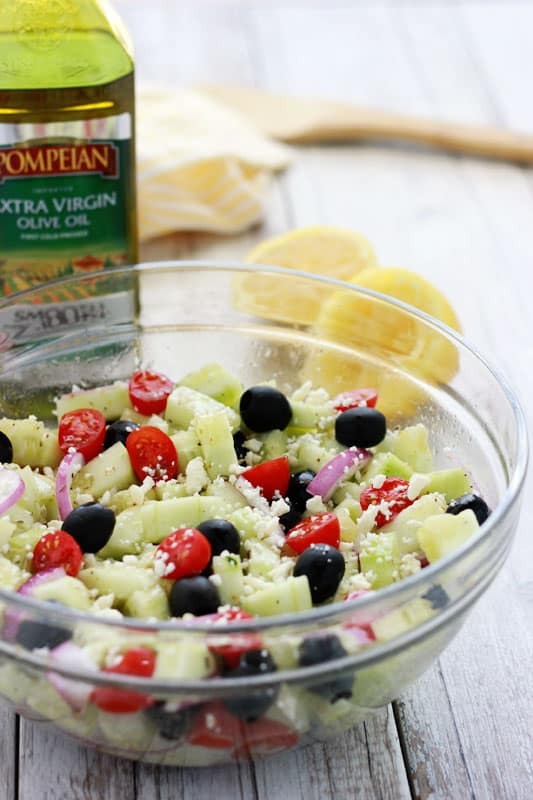 This Cucumber Greek Salad is brought to you by Pompeian. There is something about a big bowl of veggies that makes my heart flutter. I typically go for grilled or roasted but today is HOT outside. So hot that I’m dreading the thought of turning on my oven and increasing the temperature in my home any more than it already is. The good news? I have an amazing recipe inspired by the random cucumbers that were sitting on my counter patiently waiting for their turn to be the star giving me (and all of you) that veggie fix we need. 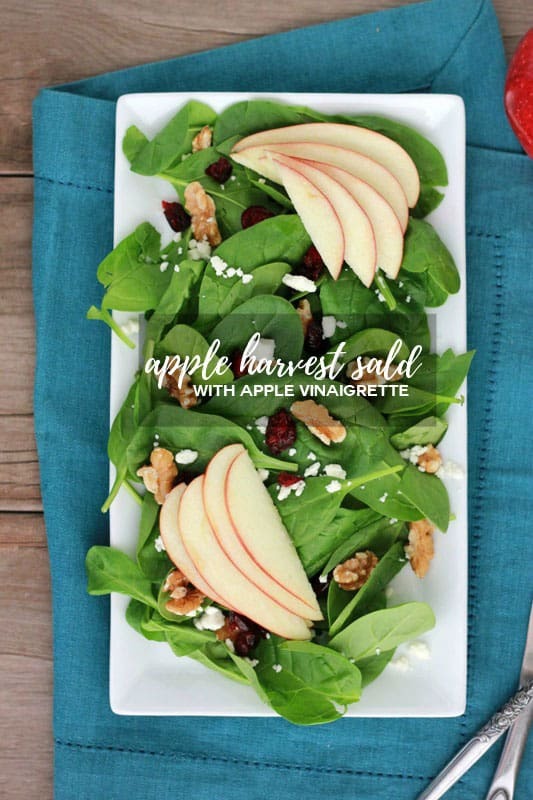 So head out and grab some of that fresh produce you’ve had your eye on and get back here so we can make this tasty salad! 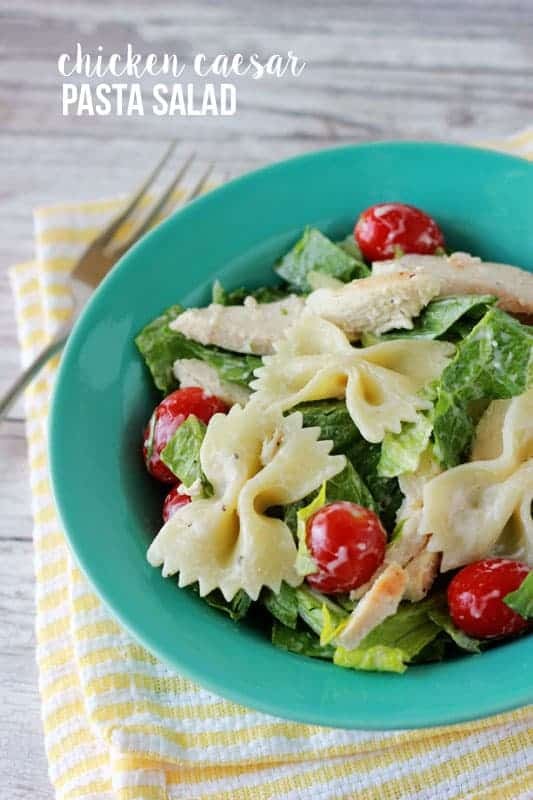 The big punch of flavor you get from this dish really comes from the dressing. It’s just a few simple ingredients but when you combine them all together you get a beautiful blend of salty and tartness which compliments the cucumbers in just the perfect way. 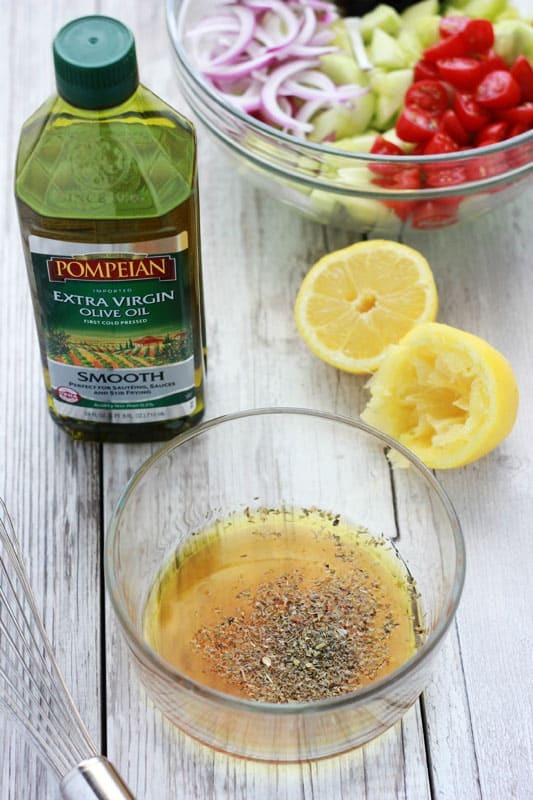 The trick is to use a Smooth Olive Oil like this one from Pompeian. 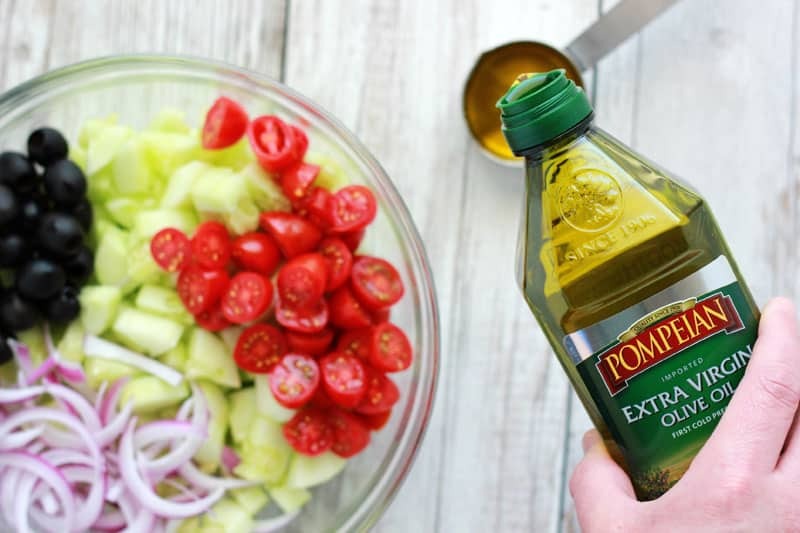 Normally I would reach for a more robust oil but when you’re dealing with lighter flavors (like this recipe and most Mediterranean inspired meals) you want an oil that will enhance but not overpower the star flavors. That is exactly what this smooth variety does. 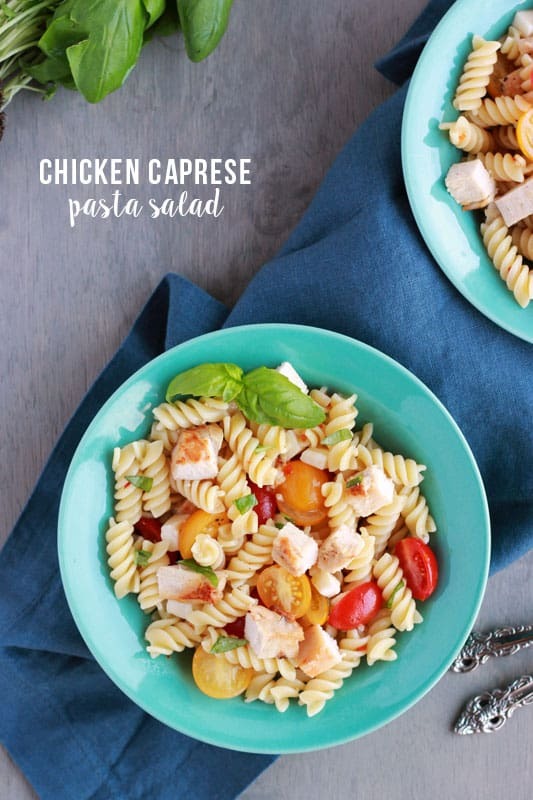 It’s well balanced with just a hint of spices leaving you room to play around and add seasonings to your taste. It also is amazing for stir fry, roasting, or sauteing (think roasted tomatoes). SO… sign up for your potlucks, request to bring a side to that pool party, or get healthy with your lunch this week. This cucumber salad is about to jump to the top of your must-make list. 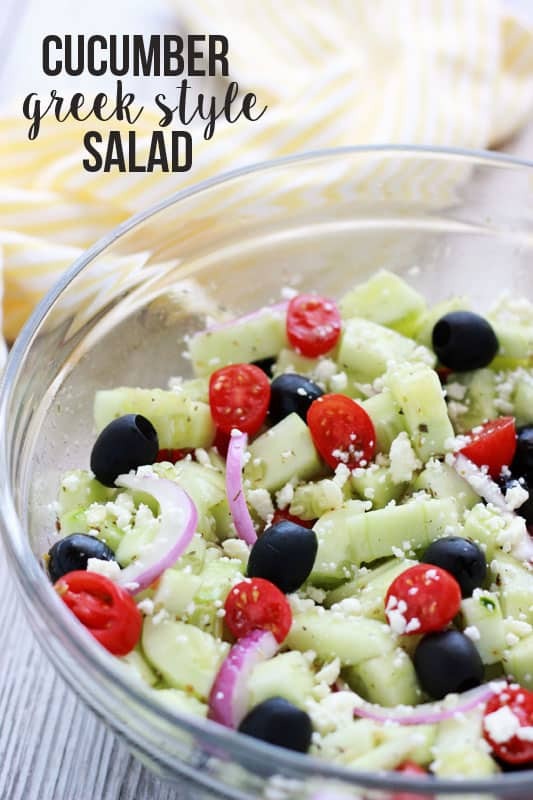 Combine your cucumbers, red onion, tomatoes, and olives in a large bowl. Set aside. Whisk together the Smooth Extra Virgin Olive Oil, lemon juice, vinegar, oregano, salt and pepper in a measuring cup. Drizzle over your bowl of vegetables. Toss lightly to coat. Sprinkle with feta and serve immediately. 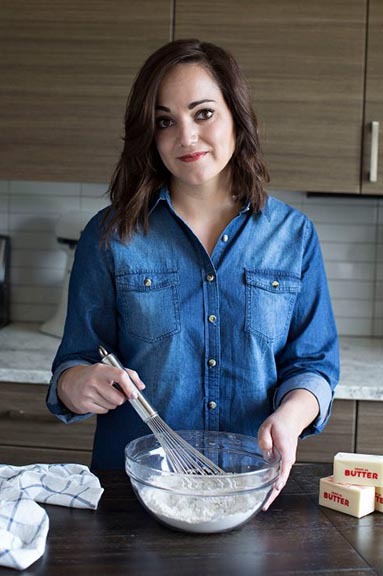 I received product and compensation in return for a post and recipe. All opinions are my own. his post may contain affiliate links. I include these links to help you find specific products that are used in my recipes. If you purchase an item from the link on One Sweet Appetite, I will receive a small commission helping keep my recipes free for you.